When I heard about a new Alkaline Trio album, I must admit I did a little happy dance in the privacy of my own home. While in my joyous two-step, I hoped that it was more like their older stuff, such as Goddamnit, Good Mourning, or even Crimson. 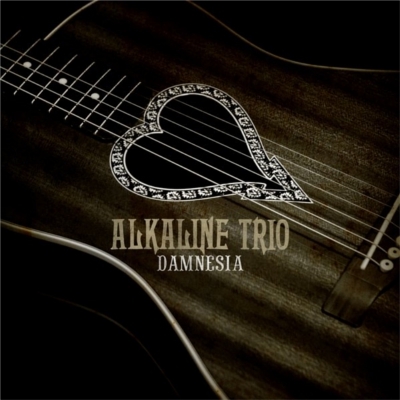 Despite it being an “acoustic” album it still possesses nuances of their angst and fervor from their earliest albums, the ones that any Alkaline fan has undoubtedly blasted at high volume and screamed the lyrics at unwitting pedestrians. For instance, their new take on “Radio” still has the same unfettered intensity despite the tempo being reduced by at least 15 bpm. Some of the vocals on certain tracks have “evolved” and become more melodic, leaving the grimy, guttural, almost growl-like phrasing behind (which, as a true fan, I love their unpolished and unique sound). In my opinion a much better release than 2010’s Agony and Irony, this album revisits and takes a new perspective on some of their best tracks. Some of them I truly enjoy, while other’s I found myself clicking “next track” because I felt their first cut was much, much better. “Clavicle” belongs to the latter description, as their vocals are too melodic and lack that crude, unrefined vocal quality that made them a hidden gem in the world of obscure rock. However, their new take on “This Could Be Love” I found to be absolutely brilliant. Vastly down-tempo from the original, the piano work is haunting and mesmerizing with the vocals operating under the same descriptive qualities. One of their hardest jams and the soundtrack to so many whiskey sours consumed, they made it sound like a completely different track with beautiful progressions. The same description applies to “American Scream.” On the flip side of that musical coin lays their new rendition of “We’ve Had Enough,” and I don’t feel at all like they’ve had enough, I feel more like I’ve had enough of some band playing the local coffeehouse, not even coming close to the passion possessed in the first mix. In closing, I have hybridized feelings about the new album which dropped July 12th, 2011. Some of their revisits I feel are not only great but possess a very unique and memorable quality missing on their earlier renderings. With others, I have to admit, I feel they come up wanting, and would prefer the older versions. However, this album was vastly better than their last release, Agony and Irony, as they went back to their roots and evolved at the same time, as paradoxical as that sounds. Alkaline Fans: Give it a shot. Newcomers: If you like indie-rock, you’ll dig this album; if you like your rock served a la carte with angst and a side of balls, check out the older albums in their discography.